The Roots Present Philly 4th of July Jam, originally uploaded by workdrugs. 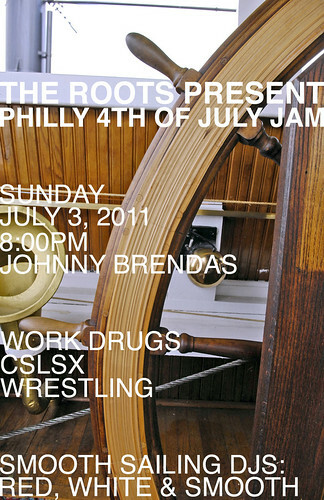 On Sunday, July 3rd, The Roots present Philly’s Fourth of July Jam with Work Drugs at Johnny Brenda’s. Work Drugs are headlining the bill, which also includes CSLSX, Wrestling (featuring a member of Power Animal) and the DJ collective of Smooth Sailing: Red White & Smooth featuring DJ’s Kenny Bloggins (Flufftronix), Christopher Crossfade (DJ Romes), Michael Tender (Low Budget), and Joey Maserati (Dirty South Joe).